Over the past few weeks, the prospect of a trolley running from Manor to San Rafael has become a bit more real. San Anselmo, Fairfax, and San Rafael all asked TAM to authorize a study of the corridor, and the county released $10,000 to do just that. Even before the study has been completed, however, it’s possible to analyze what the trolley would cost and whether a streetcar would be the best way to meet the goals of supporters and the travel demand of the corridor itself. The Marin Trolley project envisions the 5-mile Manor-San Rafael line as the first of a comprehensive streetcar system through central and southern Marin. Though the precise technologies haven’t been determined yet, Marin Trolley has been boosting battery-powered streetcars running with traffic. Unlike the old Interurban or SMART, the system would not have its own right-of-way – it could get stuck in car traffic, just as buses currently do. Headways would be about 20 minutes during regular service and presumably less during rush hour, compared to 15-45 minutes along the corridor today. Using similar systems as a guide, we can broadly estimate the cost of this first segment to be between $50 million and $220 million, which would include the cost of vehicles, maintenance facilities, rails, and battery recharging at stations. That the trolley would need to compete with traffic is not a problem unique to Marin. The DC Streetcar system is planned to run with traffic for much of its route, to the chagrin of many transit supporters. The Muni Metro system gets stuck in traffic at times, too, despite dedicated lanes that make it illegal for cars to use the same lane. Whenever doing strategic planning, it’s important to examine the goals first and create a solution that best meets those goals. Transit is no different, though often planners – especially in the US – put technology first and try to fit goals to it after the fact. It seems as though Marin Trolley may have fallen victim to this unfortunate tendency, as four of these goals are possible with buses today while the fifth, economic development, requires land-use policy changes unlikely to pass any of the three towns. None of the three regular bus lines serving the Manor-San Rafael corridor are terribly high-frequency. Route 29 runs hourly except on Sundays, when it doesn’t run at all. The first four southbound departures of Route 22 turn into Route 18 at College of Marin. Route 23 doesn’t always run east of Greenfield Avenue. Giving the corridor 15 minute headways would require some scheduling changes and possibly adding service, but is far cheaper than a new service. Level boarding is a common feature on buses, and Marin Transit has been building up its fleet. Adjustments to stops – raising the curb slightly and creating “bulb-outs” so the bus doesn’t need to pull out of traffic, which often places the bus at weird angles – would allow a roll-on, roll-off service for those who need it. Nothing beats a rail in the ground, but better communication through mapping, branding, and real-time arrival information can make bus lines feel almost as permanent. Economic development happens around bus rapid transit lines that don’t have to mix with traffic and streetcar lines that do. However, streetcars similar to Marin Trolley have typically happened in blighted areas that have huge untapped development potential, such as the H Street Corridor in Washington, DC.The Manor-San Rafael corridor lacks abandoned buildings and underused potential with the current zoning that characterizes other corridors. Without land-use policy changes that increase the density of trip origins and destinations (i.e., more homes, offices, and shops), the development potential is limited. Given how skeptical Marinites are of development and increasing density, I’d be surprised if the necessary zoning changes would get out of committee, much less passed by any of the councils. A viable alternative to driving is one that is faster and more efficient than driving. 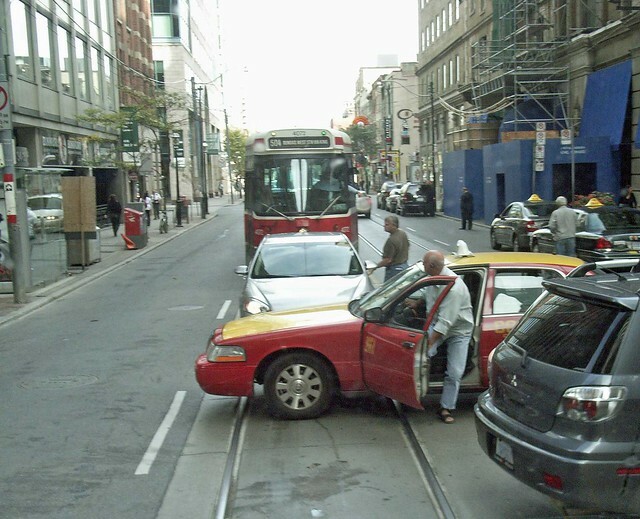 By mixing with cars, a streetcar cannot provide improved speeds over either traffic or the bus. According to Marin Trolley, 45% of travel along the corridor is two miles or less, which is within the range that bicycling is most competitive against driving. Pushing half of those trips to walking and biking would take a great deal of cars off the road. Trolleys do provide capacity improvements to buses, but there isn’t a capacity shortage. Ridership on the 23 is about 930 per day. Since more people also take the 22 and 29, I’d generously guesstimate that no more than 1400 people per day use the bus system along the Manor-San Rafael corridor. Many of those that do are students going to White Hill, meaning they would not be regular riders for the summertime. While I am skeptical of the plan as proposed, I do believe there is a chance to make the trolley a viable alternative to the car, but it involves a much more comprehensive intervention than the Marin Trolley proposal. In essence, the trolley would need to be mass transit along a pedestrian-oriented boulevard rather than a car-oriented strip. For the trolley to become mass transit, it would need to run in dedicated lanes. While it wouldn’t need the whole right-of-way that existed for the Interurban, it would need two traffic lanes in either direction. Center Boulevard, part of Broadway, and Miracle Mile would all be reduced by two lanes. In Center’s case, that would mean eliminating it as a roadway entirely. This would allow the trolley, as well as commuter buses, to beat traffic along the corridor, enticing ridership away from the roads. It would be speedy and convenient in a way that Marin’s transit hasn’t been in 70 years. To make Miracle Mile into a walkable boulevard would require traffic calming and upzoning to at least match downtowns. At the moment, San Anselmo and San Rafael have their portions of Miracle Mile zoned as “highway commercial”, which forces development to be deliberately auto-oriented. The high parking minimums would need to be eliminated, while floor-area ratios and height and density limits would need to be raised. Thankfully, the tall hills that hem in Miracle Mile means 4-6 story buildings would be able to rise without impeding views. The Marin Trolley proposal, as currently formulated, would dramatically overbuild the corridor’s transit system. Only by boosting the density and transit-friendliness of the corridor and isolating the trolley from traffic would that capacity be met. More modest interventions, such as traffic calming, Class I bicycle lanes, wider sidewalks, and replicating Fairfax’s successful elimination of highway zones, are called for along the corridor. The goals Marin Trolley outlines are best met by bolstering the existing system. At the moment, there’s no need for another one. Dave: You make many excellent points. Another that always stymied me as Community Development Director in San Rafael in terms of redevelopment potential of the Miracle Mile corridor is the shallowness of the commercial lots along Fourth Street in this stretch to San Anselmo. Very difficult to get sufficient depth to make mixed use development viable. The real goal of a trolley is to be profitable. If, when, and where our automotive transportation system becomes inadequate, competition will become profitable. Before that, we’re talking about spending someone else’s money.